How does a pilot aim for an aircraft carrier? This answer suggests the FPV is aimed ahead of the ship. But it doesn't make sense. A runway running away at 25 knots, is the same as a stationary runway plus 25 knots headwind. The relative ground speed is the same, i.e., the rate of closure, and the glide-slope is consistent. Shouldn't the FPV be targeted at the touchdown zone? Perhaps a bit to starboard, toward the island bridge, because that runway is crabbed. What am I missing? Hopefully this is a better view of what one should see on approach to a carrier. Above is a typical textbook case approach to a carrier in an F/A-18E strike fighter. I chose a picture at dusk as it is a little easier to see all the symbology and optical lights more clearly. Note the jet is aligned with the centerline of the landing area. The optical landing sight or 'ball' can be seen to the left of the landing area with the center amber light aligned with the green row of lights, indicating the jet is on a 3° glide-path and should allow it to touch down between the #2 and #3 cross deck pendants for a good 3-wire approach. 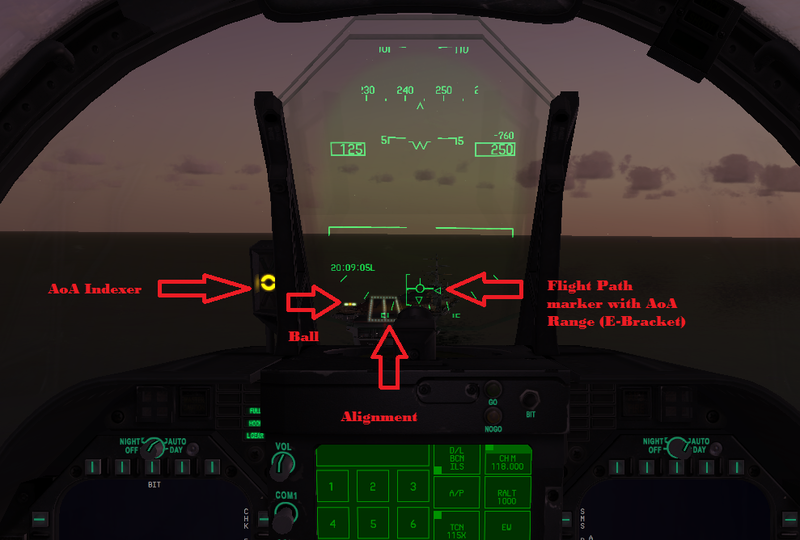 The flight path marker is centered in the 'E' bracket indicating an ideal Angle of Attack for the approach; this is also verified by the amber AoA indexer light to the left of the HUD. The pilot will do a cyclical scan of the line up, ball and E-bracket, making corrections to the control inputs on each pass. In close, over the ramp, and in the wires this cycle shifts over to a focus on the ball, tracking it all the way to the deck such that touchdown should come as a surprise. Not the answer you're looking for? Browse other questions tagged landing approach aircraft-carrier or ask your own question. What makes it so hard to land on an aircraft carrier? What is the procedure for landing on an aircraft carrier? Is landing the 'wrong way' possible on an aircraft carrier? 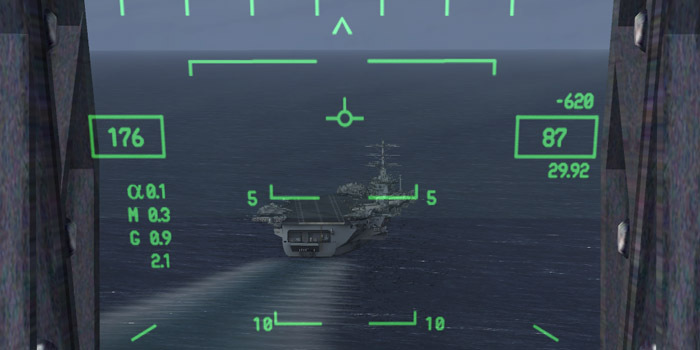 Is it easier to land planes on an aircraft carrier with a high flight deck? What is the exact responsibility of the Landing Signal Officer on an aircraft carrier? How do I calculate the required heading for an aircraft carrier with an angled deck to sail into the wind?